SPECTRUM BRUSHES: Just A Pretty Instagram Picture? Spectrum brushes are priced very well. You can get a complete eye set for around £30, which, generally speaking, is the cost of around one Mac brush. They are also sold separately with prices ranging from £4 to £10, so it's great if you just wanted to see if you like them and order one or two. They're sold on Beautybay, so you could even just add one to your next MUG order! (Shhh, I know you all do one every week like me!). In comparison to brands such as Zoeva and Mac, these are really a good beginner set if you're new to doing your make-up or just on a budget. Other brands can definitely be a little pricier if you're looking for the entire eye or face sets, but at £30 for a complete eye set or £40 for the mixed set pictured.. it's a good starting point. The 10 Piece Essentials Set (Pictured) contains.. I really love the set so far and I do find myself reaching for them all the time, which is great. The AO1 Powder Brush and CO4 Angled Powder Brush are my favourites so far to use. They are so super soft that they distribute just the right amount of product, avoiding the dreaded cake face! I love the angled brush for creating a subtle powder contour as I can really take my time and build up the colour very softly without going overboard. The eye brushes are good too and work very well with Colourpop eyeshadows. The synthetic hairs mean that Colourpop's weird cream/powder at the same time kinda formula blends like a dream! I love using them for blending out a transition colour as it's so quick because of the density. My favourites? The brow brush for sure. I've been loving this for my pomade to create a quick, thick line at the end of my brow, whilst using my Zoeva brow liner for the inner part. I wish the 10 piece collection was more varied. There are three 'little' brushes included, one being a winged eyeliner/eyebrow pomade type brush which I quite like using for my brows.. but the one I hate is the A09 Winged Eyeliner Brush. This is way too thick to be an eyeliner brush so I'm kind of wondering what to use it for and it hasn't really been used for anything yet except smudging some eyeshadow underneath my eye. Same with the A15, the lip brush. I just don't use lip brushes and this is too small and pointless to use for anything else, so it again, sits pretty abandoned. I've seen both good and bad things written, but my own opinion is that these are very good brushes and I would for sure purchase these in the future if they hold up. 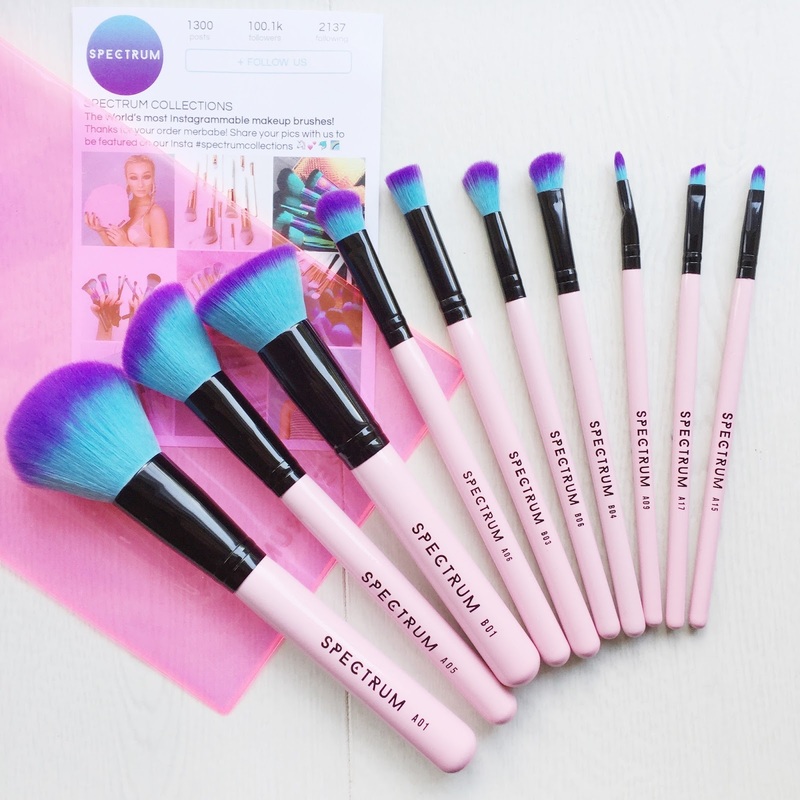 The face brushes were my favourite and if you want to try out the brand, go for those first as they are quite sturdy.. As always, I do recommend buying one or two to test out for yourselves. These aren't expensive so they aren't a major loss if they don't work for you either. This brand is a multi-million-pound company. So why do these brushes snap and break? Out of the collection I was gifted, five of my brushes broke at the ferrule and I found myself having to sueprglue them back together - they haven't broken since. Not one of my Zoeva brushes have ever done this. I feel a bit "meh" about this brand, as although some of the brushes are amazing, and I love and re-purchase my teeny little buffing brush that they sell.. it's just not good enough. These are very much brushes that you would buy your 16 year old niece, not buy and use as someone that can afford better. They're cute, but they're cheap for a reason. What do you think? 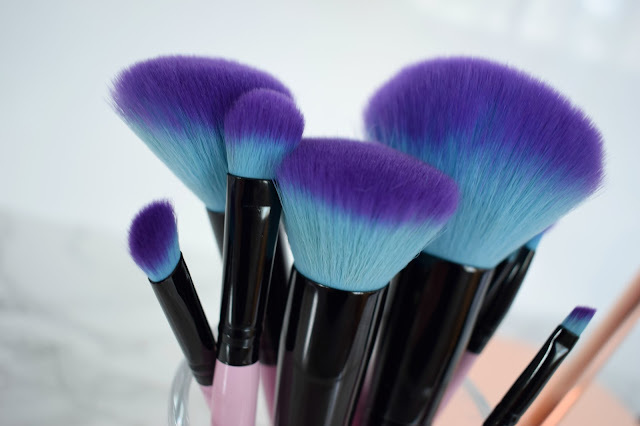 Do you own any Spectrum Brushes? LVL Lashes are finally becoming a bigger thing. I remember watching Lisa Elridge's video a while ago about them and realised how old it was! This treatment has been around for a long while, but (shock) it has just come under the spotlight since larger bloggers such as In The Frow have vlogged about their experiences, prompting people to go out and seek it! (YAY) I was really excited to be offered the treatment from Nouveau, as I love the brand. They are kind of like the standard you expect at all times from a technician and a great way to vet whether or not someone is worth going to. Their salon finder is a brilliant way to make sure whoever you want to visit for your treatments is actually registered with them (as LVL was created by Nouveau) and has had relevant training: which is very important if someone is going near your eyes. Right: After LVL, 2/3 weeks later wearing mascara - what a difference! Obviously as with any lash treatment, I went for a patch test first, around a week or so before my appointment. On the day of my appointment I went make-up free to the salon. You can wear make-up (not eye make-up) but it was just easier for me to go with nothing on and it makes it easier and fuss-free for whoever is doing it too. I was really excited as I have the most boring straight and stubby lashes ever.. or so I thought. You basically lie down on a bed for 45 minutes with your eyes shut as the technician applies the product. (Honestly, I have no idea what they do as my eyes were closed the entire time (obvs) but Nishi has a really good video of getting hers done.) It's quite a quick process, but feels like a long time as you're sitting there unable to scroll through Twitter or read a magazine! 1. Cleanse the eyes/surrounding area. 2. Apply protective pads and the shield. 3. Brush eyelashes back onto the guard and apply the lifting balm. The balm breaks down the bonds of the lashes, enabling them to be restructured into a new shape. 4. Apply the 'volumising fix'. This repairs the broken bonds to fix and secures the lashes. 6. Apply a moisturising serum to cleanse the lashes of any sticky residue left from the lifting balm, volumising fix or tint. It also nourishes the lashes with natural oils and essential moisture. Straight after your treatment you may feel as though your lashes look kind of like you've stepped out the shower (all stuck together and 'wet' looking) as a lot of pictures do look like when they have been taken straight after. This doesn't last long and once you have showered, this goes away and your eyelashes return to a 'normal' looking state! The aftercare is quite simple, you can't get your lashes wet for 24 hours and then you're good to go... For 2 days after LVL, they recommend not to steam your face, use a steam room, swim or wash your face with hot water. Pretty simple really! I left my lashes for longer than 24 hours as I had washed my hair the morning before getting it done and that night just had a cool shower so no steam rose up onto my lashes and affected them. The longer you can leave your lashes un-touched after the treatment, the better! I was sent home with a lash serum to apply each morning/evening (I added this to my after shower evening routine) It's a conditioner that keeps your lashes moisturised, pretty much. I have definitely noticed a difference in how many of my lashes fall out since using this, however that could just be because I'm being more careful with my lashes to make the LVL treatment last. Either way, it's never a bad thing to add it to your routine and it keeps the lashes separated and moisturised, especially as you want to make such an expensive treatment last as long as possible. I've seen beauty therapists advertise this treatment at around £25-35, which is an affordable treat. Here in Cambridge, and many of the smaller towns and cities where LVL isn't as accessible or popular, it is upwards of around £50. This really frustrates me, as that is pretty much the same price as eyelash extensions. I mean even Mink lashes are around £70-80. Why is LVL so much? I love the subtle look in comparison to extensions, but is the result too subtle for the price you pay? At around £35-40 or so, this could be a nice treat like acrylic nails or shellac, but for the steep fee it's currently at in many cities, It's one of those things that can put people off. Other than that point about price, I adore the treatment and I would most likely have it done again! 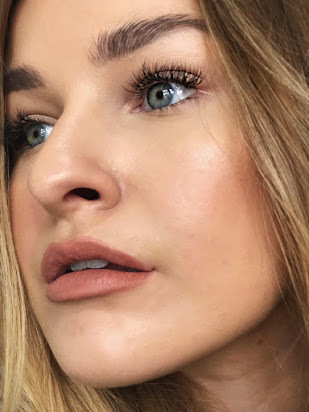 I did really love the end result as I don't think eyelash extensions are for me (they are very expensive to upkeep with all the removal in the salon etc) This is also such a fuss-free treatment and amazing way of giving your natural lashes a boost. If you don't fancy the upkeep and potential damage of extensions, give LVL a shot! Have you ever had LVL? Let me know your thoughts on the B&A photo!